It all looks fairly formulaic on paper. Captain America + cute kid + schmaltz = Gifted. The title alone may provoke groans, because it seems to be a term that is thrown around all too easily. From the outset it would seem that clichés would surely abound. Indeed, Gifted does start off threatening to go down that route. Mary (Mckenna Grace) sets off for the first grade, where her perfect sundress-wearing teacher, Bonnie Stevenson (Jenny Slate) asks the class some basic math questions. Mary is bored and Bonnie challenges her with a tricky multiplication question. Mary answers, Bonnie has to check on a calculator, and then she stares at Mary in awe. It’s so clearly a direct rip of that scene in Matilda where Miss Honey recognises Matilda’s genius that it’s almost embarrassing to see it unfold. Bonnie tells Mary’s Uncle Frank (Chris Evans) that she thinks Mary is gifted, despite having done no formal testing of any kind. But okay fine, a seven year old’s ability to do calculus probably is a good sign. Despite this shaky start, the film does get a lot better. Mary lives with her uncle Frank, for reasons that are gradually revealed through the first half of the film. He sends her to school, much to the disappointment of their neighbour, Roberta (Octavia Spencer), who expresses concern that things will not end well. Sure enough, Mary’s mathematical ‘gift’ is revealed and Frank’s mother and ex-academic, Evelyn (Lindsay Duncan) shows up, having never previously met seven-year-old Mary. While Frank just wants Mary to go to a ‘normal’ school and learn social skills, Evelyn feels that Mary’s talent should be nurtured in a specialised, intensive setting. A custody case inevitably follows. It’s tempting to say that Mckenna Grace is a natural as young Mary, but a look at imdb tells you she’s no lucky discovery. At eleven she already has 42 acting credits, which does beg the question: how much balance has SHE had growing up? She’s a smart choice, however, playing a seven-year-old at the age of ten. She looks the part but has the hidden maturity and experience required to nail the role. It’s accurate to say she steals the show; the whole cast are strong but no one else particularly stretches their acting limits. It’s weird seeing Obvious Child’s Jenny Slate act as a sweet Miss Honey type but she manages it well. Chris Evans is his likeable self, Lindsay Duncan imbues the harsher character of Evelyn with some hints of warmth, and Octavia Spencer does what she can with a mostly thankless role. It’s a sorry state of affairs that even an Oscar winner such as Spencer can still end up with so many type-cast bit roles. Even after another wonderful performance in Hidden Figures. On the one hand, it’s good to see an actor who is humble enough to take whatever part they can; it’s just that she deserves better. 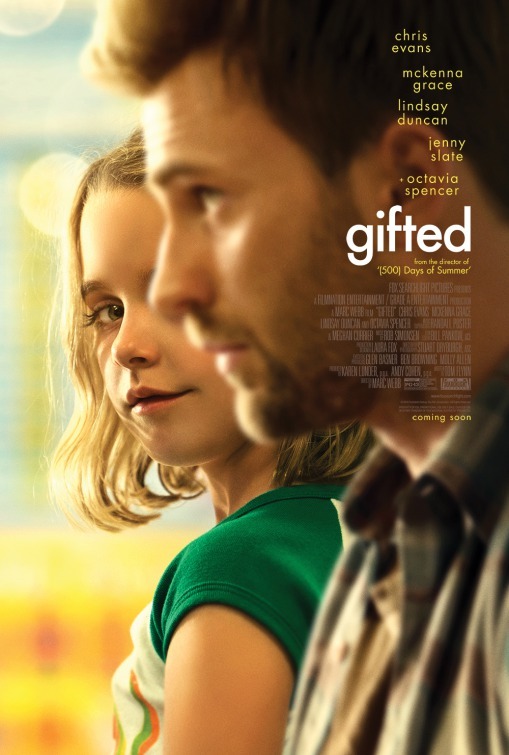 Overall, Gifted is fairly formulaic, but it deserves credit for taking the film down paths that aren’t always expected, and in presenting two different sides that both have value. Director Marc Webb surely has experience with both sorts of film, having directed big action blockbusters like The Amazing Spider-Man as well as indie hits such as 500 Days of Summer. Screenwriter Tom Flynn has limited experience but does well in providing some quality patches of dialogue – with Evelyn’s courtroom speech and Frank’s response to Mary’s question about God particular highlights. It teeters precariously on the edge of cliché at times, but Flynn’s future looks promising.